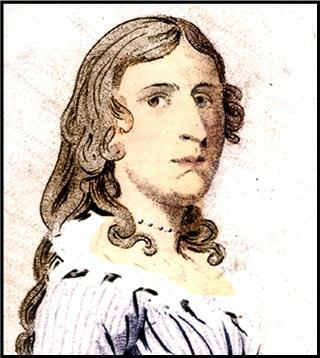 Deborah Sampson was born on 17 December 1760 in Plympton, Massachusetts. Sampson's mother was the great-granddaughter of William Bradford, Governor of Plymouth Colony. Some of her ancestors also included other Mayflowerpassengers. When Sampson's father abandoned the family, her mother was unable to provide for her children, so she placed them in the households of friends and relatives, a common practice in 18th-century New England. Deborah was placed in the home of a maternal relative. When her mother died shortly afterwards, she was sent to live with Reverend Peter Thatcher’s widow Mary Prince Thatcher (1688–1771), who was then in her eighties. Historians believe she learned to read while living with the widow, who might have wanted her to read Bible verses to her. Upon the widow's death, Sampson was sent to live with the Jeremiah Thomas family in Middleborough, where she worked as an indentured servant from 1770 to 1778. Although treated well, she was not sent to school like the Thomas children because Thomas was not a believer in the education of women. Deborah was able to overcome Thomas’s opposition by learning from Thomas’s sons, who shared their school work with her. This method was apparently successful; when her time as an indentured servant was over at age 18, Sampson made a living by teaching school during the summer sessions in 1779 and 1780. She worked as a weaver in the winter; Sampson was highly skilled and worked for the Sproat Tavern as well as the Bourne, Morton, and Leonard families. During her time teaching and weaving she boarded with the families that employed her. She stood about 5’-8” inches tall, was heavy boned, very strong and of light complexion. In early 1782, Sampson wore men’s clothes and joined an Army unit in Middleborough, Massachusetts, under the name Timothy Thayer. She collected a bonus and then failed to meet up with her company as scheduled. Inquiries by the company commander revealed that Sampson had been recognized by a local resident at the time she signed her enlistment papers. Her deception uncovered, she repaid the portion of the bonus that she had not spent, but she was not subjected to further punishment by the Army. The Baptist church to which she belonged learned of her actions and withdrew its fellowship, meaning that its members refused to associate with her unless she apologized and asked forgiveness. under the command of Captain George Webb (1740–1825). This unit, consisting of 50 to 60 men, was first quartered in Bellingham, and later mustered at Worcester with the rest of the regiment commanded by Colonel William Shepard. Light Infantry Companies were elite troops, specially picked because they were taller and stronger than average. Their job was to provide rapid flank coverage for advancing regiments, as well as rearguard and forward reconnaissance duties for units on the move. Because she joined an elite unit, Sampson’s disguise was more likely to succeed, since no one was likely to look for a woman among soldiers who were specially chosen for their above average size and superior physical ability. Her first narrow escape from discovery was when she was altering her poorly fitting uniform, and was observed to be very good with a needle. She explained it away by stating there were no girls in her family, so as a youngest she had to learn how to sew. Shortly thereafter, her Regiment marched to West Point to protect the Hudson Highlands from the British who still occupied New York City. There were numerous engagements between the two opposing forces along “No Man’s Land” .Near the Tappan Zee she fought her first battle, and gave a good account of herself. But she received a sabre wound across the left side of her head. She refused to go to the hospital, fearing discovery, and tended the wound herself. Within weeks she was in another skirmish and this time she was hit in the thigh by a musket ball. This time there was no preventing being carried to the hospital. But, once there, she showed the surgeon the lesser wound to her head, and he released her. She tried to dig the musket ball out of her thigh with her pen knife! Failing that, she nursed the wound as best she could. But, having left the ball in the leg was to cause her trouble for the rest of her life. The Fourth Massachusetts was transferred to Philadelphia, and there Robert/Deborah was assigned to General John Patterson, Brigade Commander, as an orderly. She was then taken ill with a severe fever, rendering her unconscious. Taken to the hospital, where Doctor Barnabas Binney discovered that Robert Shurtleff was really Deborah Sampson. The good doctor decided to cooperate with the gallant lady soldier and conceal his findings. Unfortunately, as Robert was being nursed back to health, the Doctor’s niece fell in love with him/her. Nothing could be done at this point but to admit to the deception.